Here is two recent addition to my youtube movies. The first is a collection of old sketch book drawings. While shopping on Amazon for something else, I decide to pick up DVDs of some shows I worked on. So, I picked the ExoSquad Season 1, and the Adventures of the Galaxy Rangers, The Collection Volume 2. I figure these show may not show up in Blu-Ray. I consider myself lucky they showed it in DVD, at all. By contrast, I have little hope that the Nascar Racers series will every been released by Disney. Also, it seems the remainder of the Disney Gargoyles episodes may never be released. I hope the second season of ExoSquad gets released sometime. I directed half the shows of the second season and got to design some characters, like this Neo-Lord, which was turned into a action figure toy. I was only the oversea animation supervisor on the first season, but that lead to my move to LA. The Galaxy Ranger Vol.2 completes the set, I had Vol. 1 already. It nice to see some of my art on the cover and in the booklet. Funny thing, I was shopping in a local Big Lots, a discount store, and there was the Exosquad DVD for $3. WTF!!? No harm done, I only pay $10 on Amazon. Actually, I've been picking up more DVDs, animation and live action, by video "dumpster diving" into discount bins. If you not hang up on the Blu-Ray craze, it is a good time to pick up some DVDs of stuff you where interested in, but not enough to pay full price for. Some stuff I view once and put up on Ebay. That's getting tougher to do with the price dropping so much. I just posted a video of the Illustrated Movie book of the Spartacus the classic film form 1960. It has some great production drawings, movie stills, lobby art cards and other good. It is probably out of print, I picked this up at a old book store in Burbank, CA. The new Starz Spartacus: Blood and Sand reminded me of how much I loved the original. My favorite scene is the first fight between Spartacus (Kick Douglas) and Draba (Woody Strode). This video to dedicated to Jean Simmons (Varinia), who recently passed ago, and Woody Strode. Woody Strode screen time was brief, but it had a great impact on me as 10 year Black kid watching the film in the theater. 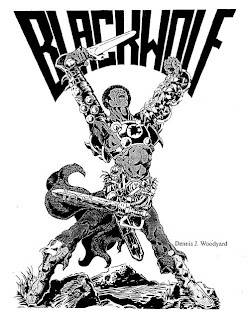 The Draba character was the basic for my Conan-inspired "Blackwolf " (follow the link to the Blackwolf section of my website)website. I meet Woody Strode one time, purely by chance, he was appearing at a Movie Fan convention at the Beverly Garland Hotel in North Hollywood the weekend I was there just before going to Korea for Universal Exosquad as oversea superviser. I dropped in on the convention, just to kill time and there was Woody Strode signing autographs and sharing stories about his acting career. I bought the movie still in the video and had Woody sign it. Then I went back to my room and return with a drawing of my Blackwolf character. I give Woody the drawing which I signed and thanked him for his inspiration. I not a big stargazer, but I'm glad a got chance to thank him in person. Back in the 1950's and '60's there were very few black action heroes in films. The quiet Woody Strode played in some of my favorite action movies, Spartacus, The Professionals, with Lee Marvin and Burt Lancaster, and Pork Chop Hill, with Gregory Peck. He was alway a support character. One of his best role was in Sergio Leone's Once upon a Time in the West, although he get killed off in the first two minutes of the film, but it was a great two minutes. I read Woody Strode's autobiography last year and marvel at his achievements before entering the acting. For example, he was one of the first African-American to play professional football, back in the 1930's, long before Jackie Robinson broke the color barrier in Major League Baseball. I plan to present more of Woody Strode's work in the future. Here is my annual Happy Birthday wish for my father, the late Sam Woodyard, drummer for the Duke Ellington Band. His memory lives on, alive and well in the music he loved, Jazz. Enjoy. Creator and designer of Dragonfly Flipz™ Books, and an former Emmy nominated animation producer / director / story board artist with a wide range of experience in animation field, ranging from story boarding and character design, to production supervision.